The first edition included numerous cross-references meant to connect articles scattered by the use of alphabetical order, a dedication to the King, George II, and a philosophical preface at the beginning of Volume 1. Among other things, the preface gives an analysis of forty-seven divisions of knowledge, with classed lists of the articles belonging to each, intended to serve as a table of contents and also as a directory indicating the order in which the articles should be read. A second edition appeared in 1738 in two volumes in folio, with 2,466 pages. This edition was supposedly retouched and amended in a thousand places, with a few added articles and some enlarged articles. Chambers was prevented from doing more because the booksellers were alarmed by a bill in Parliament containing a clause to oblige the publishers of all improved editions of books to print their improvements separately. The bill, after passing the House of Commons, was unexpectedly thrown out by the House of Lords; but fearing that it might be revived, the booksellers thought it best to retreat though more than twenty sheets had been printed. Five other editions were published in London from 1739 to 1751–1752. An edition was also published in Dublin in 1742; this and the London editions were all 2 volumes in folio. An Italian translation appearing in Venice, 1748–1749, 4to, 9 vols., was the first complete Italian encyclopaedia. When Chambers was in France in 1739, he rejected very favorable proposals to publish an edition there dedicated to Louis XV. Chambers' work was carefully done, and popular. However, it had defects and omissions, as he was well aware; at his death, on 15 May 1740, he had collected and arranged materials for seven new volumes. George Lewis Scott was employed by the booksellers to select articles for the press and to supply others, but he left before the job was finished. The job was then given to Dr. John Hill. The Supplement was published in London in 1753 in two folio volumes with 3307 pages and 12 plates. Hill was a botanist, and the botanical part, which had been weak in the Cyclopaedia, was the best. Abraham Rees, a nonconformist minister, published a revised and enlarged edition in 1778–1788, with the supplement and improvements incorporated. It was published in London, as a folio of 5 vols., 5010 pages (but not paginated), and 159 plates. It was published in 418 numbers at 6d. each. Rees claimed to have added more than 4,400 new articles. At the end, he gave an index of articles, classed under 100 heads, numbering about 57,000 and filling 80 pages. The heads, with 39 cross references, were arranged alphabetically. Among the precursors of Chambers's Cyclopaedia was John Harris's Lexicon Technicum, of 1704 (later editions from 1708 through 1744). 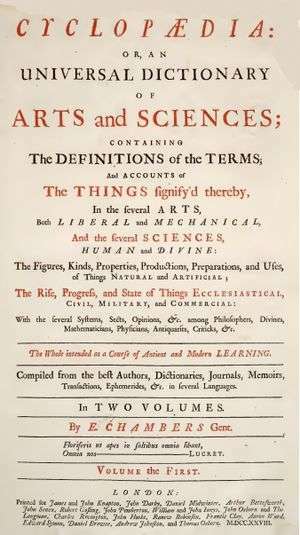 By its title and content, it was "An Universal English Dictionary of Arts and Sciences: Explaining not only the Terms of Art, but the Arts Themselves." While Harris's work is often classified as a technical dictionary, it also took material from Newton and Halley, among others. Chambers's Cyclopaedia in turn became the inspiration for the landmark Encyclopédie of Denis Diderot and Jean le Rond d'Alembert, which owed its inception to a proposed French translation of Chambers' work begun in 1744 by John Mills, assisted by Gottfried Sellius. This article incorporates text from a publication now in the public domain: Chisholm, Hugh, ed. (1911). "Chambers, Ephraim". Encyclopædia Britannica (11th ed.). Cambridge University Press. Bocast, Alexander. Chambers on Definition. McLean: Berkeley Bridge Press, 2016. (ISBN 978-1-945208-00-3). Bradshaw, Lael Ely. "Ephraim Chambers’ Cyclopedia." Notable Encyclopedias of the Seventeenth and Eighteenth Centuries: Nine Predecessors of the Encyclopédie. Ed. Frank Kafker. Oxford: The Voltaire Foundation, 1981. 123–137. (ISBN 0-7294-0256-8). Kafker, Frank. A. Notable Encyclopedias of the Late Eighteenth Century: Eleven Successors of the Encyclopédie. Oxford : Voltaire Foundation at the Taylor Institution, 1994. Kolb, Gwin J. and James H. Sledd. “Johnson’s ‘Dictionary’ and Lexicographical Tradition.” Modern Philology 50.3 (Feb. 1953): 171–194. Mack, Ruth. “The Historicity of Johnson’s Lexicographer.” Representations 76 (Fall 2001): 61–87. Wikimedia Commons has media related to Cyclopaedia. Chambers' Cyclopaedia, 1728, 2 volumes, with the 1753 supplement, 2 volumes; digitized by the University of Wisconsin Digital Collections Center. Chambers' Cyclopaedia, 1728, 2 volumes, articles are categorized.